Last week, we heard Jesus call us into a friendship with Him. He states three requirements for friendship, obedience, love, and self-sacrifice. Although we cannot be friends with the world and be a friend of God, we must develop relationships with unbelievers for the purpose of introducing them to our Friend, Jesus. In doing so, we must stay true to the Word of God, making sure we develop disciples of Jesus and not disciples of ourselves. John 15:12-15 This is my commandment, that you love one another as I have loved you. Greater love has no one than this, that someone lay down his life for his friends. You are my friends if you do what I command you. No longer do I call you servants, for the servant does not know what his master is doing; but I have called you friends, for all that I have heard from my Father I have made known to you. Jesus demonstrated these requirements in His obedience to the Father, His love for the Father, and the sacrifice of Himself for those He loved (including us). He wants us to identify with Him and do the same things for Him and for one another. This week, we will take a closer look at Abraham to understand how to become a friend of God and I pray each of us will make the commitment to become one. Abraham grew up in a family that worshipped idols. Every person has an innate sense that there is a God, a Creator, and people attempt in various ways to connect with this divine being. Some people deceive themselves by choosing to believe there is no God. In either case, without Jesus Christ their lives become joyless, purposeless, and full of vanity and anxiety. Abraham wanted to know the true God. The man-made idols did not communicate with him nor satisfy the longing in his soul. So, how did Abraham discover God? Jeremiah 29:13 You will seek me and find me, when you seek me with all your heart. Do you desire God? Are you seeking Him or things of the world? Do you read His Word to know Him and His will? Hebrews 11:6 And without faith it is impossible to please God, because anyone who comes to Him must believe that He exists and that He rewards those who earnestly seek him. Abraham was earnest in his search and sought God with all his heart. As a result, God rewarded Abraham by revealing Himself to him. So, how did Abraham become God’s friend? James 2:23 and the Scripture was fulfilled that says, “Abraham believed God, and it was counted to him for righteousness”—and he was called the friend of God. Here we see the initial requirement for friendship with God: faith. Abraham had no Bible nor preacher to tell Him God existed, but He had faith that God did exist and this faith gave Abraham a desire to know God, believe Him, and obey Him. Abraham was not perfect. He lied at least twice about Sarah being his sister to save his own life. Nevertheless, the Bible says in Genesis 15:6 And he believed the LORD, and he counted it to him as righteousness. Remember, we do what we truly believe. If we truly believe the LORD, we will obey Him. When God spoke to Abraham, Abraham changed his ways. God tested Abraham and Abraham did not withhold anything from God, not even his son. Abraham lived his life by faith in God. Therefore, God counted it to him as righteousness (which means being in right standing with God), and for that reason, God called Abraham His friend. But how about us? Is your number one goal in life to please God or yourself? Do you start each day by praying to God, “I want to obey you today with my life. Fill me with your Holy Spirit and give me grace to die to myself.”? If we determine that our number one goal is to obey God, then every other aspect of our life will fall into place. We will fail occasionally, but we will repent and keep trying. Abraham was called the friend of God because he lived a life of faith which translated into obeying God. To obey, we must listen for God’s voice. To hear God properly, our spiritual ears must be turned on by faith and then tuned into the proper frequency. It’s like your car radio: you’ve tuned into your favorite station, and then it starts to fade and become distorted. Why? It’s because you have traveled out of range. The friend of God, not only has his spiritual ears tuned into the proper frequency, but he doesn’t let temptation and sin lead him out of range. The friend of God is tuned into God all the time. However, hearing the Word of God and agreeing with it mentally is not obedience. When we only listen and fail to obey, we deceive ourselves into thinking we are in right standing with God. When Abraham heard God, he obeyed, trusting God to make everything work for good. Genesis 12:1-4 Now the LORD said to Abram, “Go from your country and your kindred and your father’s house to the land that I will show you. And I will make of you a great nation, and I will bless you and make your name great, so that you will be a blessing. I will bless those who bless you, and him who dishonors you I will curse, and in you all the families of the earth shall be blessed.” So Abram went, as the LORD had told him, and Lot went with him. Abram was seventy-five years old when he departed from Haran. At this point in time, Abraham was still called Abram, for God had not yet changed his name. Notice his response. So Abram went, as the LORD had told him. There’s no discussion, there’s no decision that has to be pondered and prayed over. He heard God’s voice, and he obeyed without question. How do we respond to God’s gentle voice, the Holy Spirit? Maybe we are not sure it is the voice of God we hear. We need to seek the Holy Spirit earnestly and become familiar with His voice. Familiarity with the Word of God will help us identify the voice of God, for the Holy Spirit will not contradict the Word. When we do hear God, sometimes we are not as quick to respond as Abram because we are reluctant; we’d rather not do it. Sometimes we start negotiating with God, asking for more time or for another way of doing things. However, that is not obedience. When we hear God’s voice, we must obey immediately or else become the most miserable people on earth. The joy and peace resulting from obedience is the greatest reward we’ll ever receive in this lifetime. Do you think Abram fully understood the impact his obedience would have on him, his family, and the entire world when he left Haran? Neither do we know what lives we will touch and how those lives will impact the future. Nevertheless, the friend of God, by hearing and obeying God, becomes an instrument of blessing to others in ways they may never know. 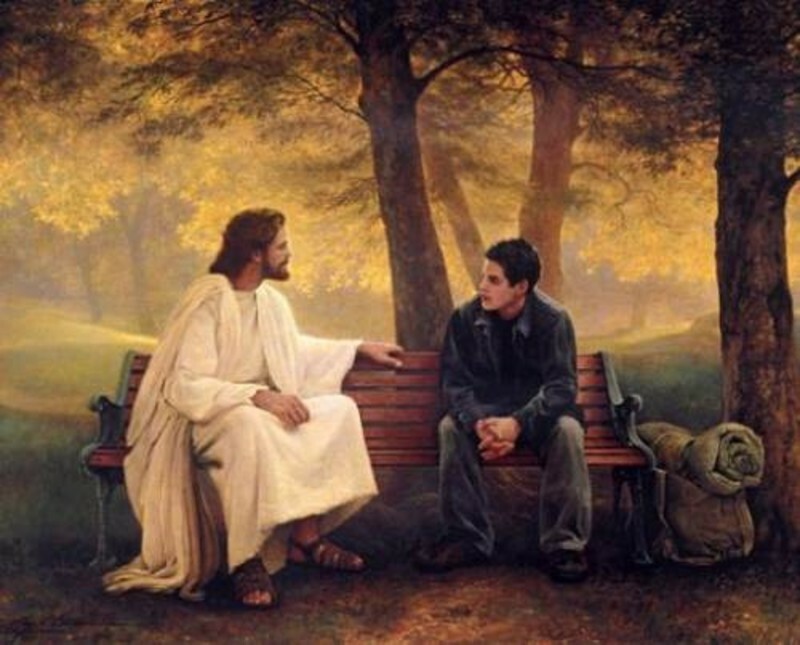 So, how can we become God’s friend? Let’s review the ways we have seen from the Scriptures. 1. We become a friend of God by believing in Him. Hebrews 11:6 And without faith it is impossible to please him, for whoever would draw near to God must believe that he exists and that he rewards those who seek him. There is no way that we will ever be able to please God and become His friend if we do not believe in Him and what He can do. We place our faith in God when we trust Him completely, even when life seems unfair, is painful, and doesn’t make sense. The Bible concept of faith or belief reaches well beyond mental assent. Literally, belief in God is to “adhere” to Him; “trust” in Him; “rely” on Him. 2. We become a friend of God by loving Him. Our first priority is to love God with our spirit, soul (mind, will, and emotions), and body. Then we will have God’s grace to love others. We show them love by treating them the same way we would like to be treated. Abraham loved God and he proved it by obeying God. He wasn’t perfect in his performance, but his heart was set to do God’s will. His desire was to please God. Love for Jesus is not something sentimental or emotional. It is a life of obedience, loving Him and others, and self-sacrifice. This kind of love is the most practical thing imaginable for living a joyful, peaceful, and blessed life. If you want an intimate friendship with God, keep in constant contact with Him, but make a special time every day when it is just you and Him. That is His desire. That special time of fellowship is the greatest gift you can give God and also, the greatest gift you can receive from God after salvation. 3. We become a friend of God by obeying Him. Abraham proved his love for God by obeying Him. He left his homeland; he went to a land and culture that he was unfamiliar with; he was even willing to offer his one and only son to God. If we truly love God, we’ll do more than just talk about it or sing about it. We’ll prove it by our obedience. 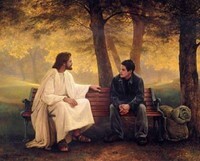 As we seen several times, Jesus told His disciples that we become His friends if we do the things He commands us to do. Besides, loving Him and others, what other things does God want us to do? 1 Thessalonians 5:16-18 Be joyful always, pray continually, give thanks in all circumstances; for this is God’s will for you in Christ Jesus. The will of God is not hard and joyless. Along with loving God and others, these simple commands of rejoicing, praying, and giving thanks at all times are a blessing to us and they make us a blessing to others. Why does anyone want to live differently than this, which is God’s will? Unfortunately, we choose our own misery when we choose the ways of the world or our own self will. 4. We become a friend of God by sacrificing ourselves and serving Him. Romans 12:1 I appeal to you therefore, brothers, by the mercies of God, to present your bodies as a living sacrifice, holy and acceptable to God, which is your spiritual worship. God wants us to be a living sacrifice, serving Him. Yes, there many things and ways we can get involved in the church, but true service and worship is lived out each and every day. In every area of our life, we are to do everything as unto God! Colossians 3:23-24 Whatever you do, work heartily, as for the Lord and not for men, knowing that from the Lord you will receive the inheritance as your reward. You are serving the Lord Christ. Now that you know what a friend of God does, can you say with complete confidence, “I am a friend of God.”? As I said last week, we have a choice. We can become a friend of God or a friend of the world. We cannot be friends of both. The things of the world are attractive. The temptation is to fit in and enjoy worldly popularity. However, the one true desire of a Christian is the Lord Jesus. If you realize you haven’t been a very good friend of God, repent of living for yourself and earnestly seek an intimate relationship with Him. Invite the Holy Spirit, every day, to take control and lead you. Talk with God all day long. Read His Word daily and obey it. Then you can enjoy His friendship. All of us, at one time, were enemies of God because of sin. Jesus Christ has reconciled us to the Father by atoning for our sin on the cross. If you feel God calling you into a friendship with Him and you have never responded, now is the time. Believe that Jesus Christ is the Son of God and publicly confess Him as your Lord. Repent of your sin and sacrifice yourself to Him by following Jesus in baptism. You will be born again of the Holy Spirit, who will lead you into an intimate friendship with God.